Our series of electrical technology training set is easy and safe to operate. It is reasonable in structure and beautiful in appearance. Made of high-quality industrial profiles, it is solid and durable. Its surface is coated with powder imported from Netherlands. The combination of blue and silver meets the requirement of current technology mainstream. 5. The power box is provided with multiple protection devices which can protect against overcurrent, undervoltage, short circuit, electric leakage, etc. 6. There are two stainless steel mesh plates attached. Their size is 640mm×730mm. they can be removed easily to facilitate practical training. 7. The blue column frame made of industrial aluminum profiles can be dismantled easily, which facilitates transport. 8. 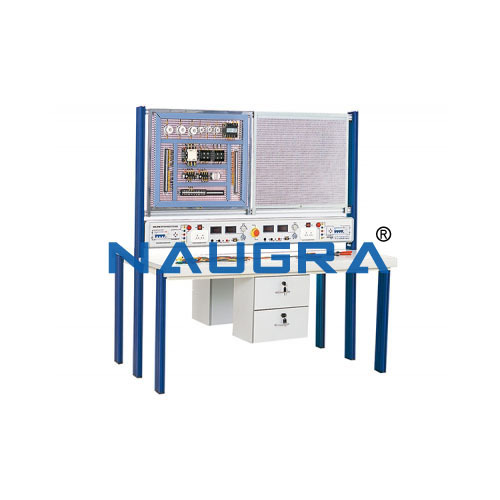 The electrical technology training set is added with a meter box on the basis of the electrician training device. Inside the meter box, there is a voltmeter, ammeter, three-phase power meter, single-phase power meter, power factor meter, frequency meter, and single-phase watt-hour meter.